Despite the early onset on intense heat in the great Subcontinent (many days topped 40 degrees C) Mango season had not yet started in India. Malaysia was another story. During one quick visit to an indoor fruit market in Kuala Lumpur, we discovered at least five varieties I had never before encountered or tasted. The Black Gold Mango looks unripe from the outside, but it is superbly ripe inside. I bought half a kilo. Slightly curved at the tip and a yellowish tinge and soft-ish flesh means it’s ripe. The softer it is, the riper and sweeter it is. The flavour seemed to have an aftertaste of Alphonse, the famous mango of India. Very satisfying. 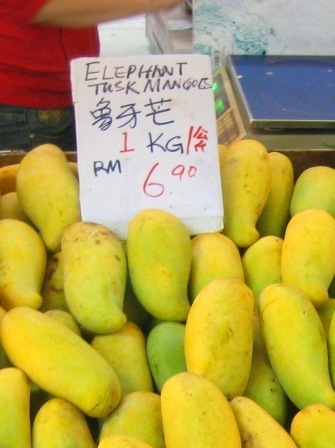 I have a suspicion that despite the market vendor telling me these were all Malaysian produce, the Elephant Tuskmangoes came from Thailand (not far from Malaysia!) They were nice, but not my favourite. The pit inside was very thin. I didn’t try a Green King Mango. 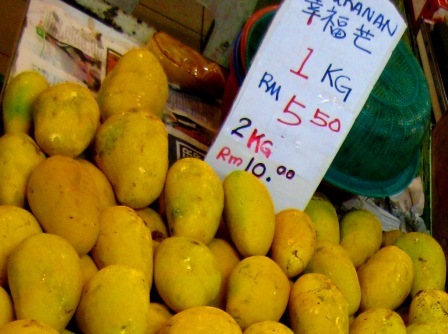 Note the prices – average 5-6 Malysian Ringgit a kilo. That’s around 2 Australian dollars. Apparently the Chokanan variety are very popular in Malaysia. They were my second favourite, after the Black Gold. The Golden Lily mangoes (bottom of the picture) were also very nice. To be quite honest, I bought at least another two varieties that looked similar, so I lost track of which was which after we brought them home. Nevertheless it was an altogether delightful and educational encounter!